(Newser) – Pennsylvania, Connecticut, Rhode Island, New York, and Delaware hold their Republican primaries today, and while many observers have already heard the fat lady sing for Newt Gingrich, there may still be a twist or two left in the race. Gingrich has been spending a lot of time in Delaware and he may be able to rally conservatives and jolt Mitt Romney by snatching a surprise primary win like the one Christine O'Donnell scored in 2010, Politico finds. 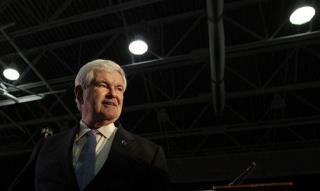 i think newt heard helmethead singing all the way to the bank! Gheez, he is as dumb as Romney.